Ranches of Sonterra an established community with reasonable restrictions just minutes from Ruidoso. This 12.643 AC wooded home site is mostly level with a gentle slope toward the rear of the property. Plenty of room to build your dream home. Paved roads offering year round access. Horses and metal buildings allowed see restrictions for more information. Property owners park along river. A great place to call home with nice homes and friendly neighbors. 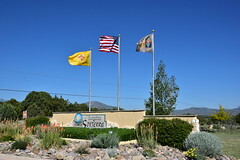 Spencer Theater, Alto Lakes, Sierra Blanca and Golfing near by. Lot is mostly level with a gentle slope toward the rear of the property. A water well was drilled on property in October 2007. Electric available located near by. Private septic system required. The HOA dues are currently $110 per year. Taxes for 2016 were $795.55. Raw land, no gate. Can show any time. © 2019, Fallon Cortese Land/Cortese Homes & Land. All Rights Reserved.